Most years there are a handful of entries in the Open House listings that make you think "oh my word, are they actually allowing access to that?!" In 2004 it was the Gherkin, in 2010 TfL HQ, and this year the BT Tower. But scanning through the list there was also the opportunity to go inside one of the holy grails of Urban Exploration, Millennium Mills in Silvertown, for a 100% legitimate tour. This crumbling ten-storey flour mill beside the Royal Victoria Dock has lured in many a balaclava-ed trespasser keen to experience the danger of its gaping internal voids and the thrill of standing on its roof. And suddenly they're running public hard hat tours, you say, OMG wow! Oh, but only a tiny handful of tours, and with less than ten people on each, so not a chance of getting a place. Sadface. But I got lucky. Doubly lucky, in fact, because wasn't the weather at the weekend ace? The opportunity to explore a taboo building in perfect sunshine was like winning the lottery, so I bounced along, togged up in hi-vis and boots, and grinned. So there's this vast area of undeveloped land to the west of City Airport, opposite the ExCel exhibition centre, which used to be part of East London's docks. This section was all about importing food, and specifically flour, and at the start of the 20th century the three largest milling companies established premises here. Millennium Mills was built in massive style by William Vernon & Sons, who named the building after their most successful brand of flour. The current building's not the original, which was badly damaged by the great Silvertown explosion of 1917 and again by bombing during World War Two. But the 1953 building survives, which is quite something given that flour production shifted to Tilbury in the 80s and the concrete monster's been empty ever since. Today it's the sole survivor on a 60 acre site, bar a bit of the Rank Hovis mill nextdoor and a mighty grain silo nearer Pontoon Dock station. And change is imminent. There have been many attempts to build on this site over the years, including a millennial plan to build a new residential zone around a massive aquarium called Biota. That eventually stalled when the developers went quiet, so the next team on the block are the so-called Silvertown Partnership who got the nod in April. They're planning a creative quarter, which'll be mostly housing but also with a heavy commercial slant, the intention being to attract digital start-ups and boost the knowledge economy. Half of Pontoon Dock will be filled in, and the majority of the site tightly packed with flats and offices and very little open space. More depressingly there are plans to create a 'brand village', where large multinational companies will build consumer temples to enhance their commercial reputation - not so much shops as a showcase designed to enhance online purchase. They never mentioned the brand village on the tour, I think they realised we'd only have ripped the piss. 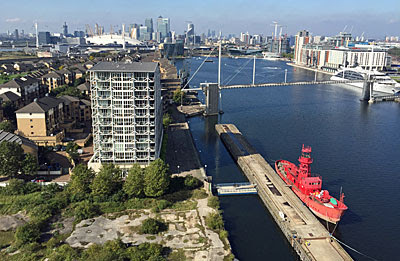 "Silvertown Quays will provide a unique experience in what will be the first purpose built brand destination in the world; and through a series of brand flagships, pavilions and trading houses, organisations will be able to showcase and engage with their consumers through education, entertainment and customisation." At the far end of Millennium Mills, nearest the airport, is what remains of the Rank Hovis Premier Mill. This brick edifice isn't as tall, nor as listed, as its iconic neighbour, but it does house the one remaining grain chute still in situ. This spirals down from above like a rusting worm, and should be saved for posterity so long as the building around it is too. Some of the hoppers have been rescued, for which read dumped outside in piles for artists to use creatively in the new development. For now, however, the main residents are pigeons flying in through absent doors and smashed windows, and workers from Up North storing boxes and boxes of air filters for asbestos removal purposes. Jay and his mates expect to have all the evil fibres out soon, vastly increasing the value of the property overnight and kickstarting proper development... there'll be no more public tours after this. Gaining access to the upper levels of Millennium Mills is currently possible via builders' lift. This jerks up the outside of the building to the seventh floor where a scaffolded platform provides an excellent (but temporary) view to the south and east. That golfball dome is what's left of the notorious London Pleasure Gardens, a 2012 attempt to bring the place to life which crashed and burned financially after demonstrating Herculean levels of organisational incompetence. And yes, the City Airport flightpath is ridiculously close, with planes roaring upwards over the dock pretty much right next to the front of the mill. If you're ever thinking of buying a property here, don't let the estate agent trick you into a site visit on Saturday afternoon or Sunday morning when the runway is conveniently closed. We merry band of Open Housers were then invited to step inside the building, most probably through what used to be a window. We were at least a year too late to see the building at its worst, with almost all of the grain slides and silos and associated metalwork long removed. Instead we'd entered a concrete shell of roof beams and floors, the latter regularly broken by large (and very large) holes. These voids are the ultimate health and safety nightmare, or trespasser's thrill, but they're also the reason why this building faces a bright commercial future. 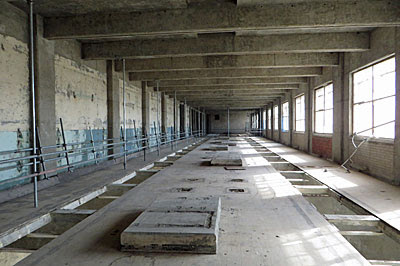 Most old buildings have no space to thread cables and utilities through the floors, but Millennium Mills has holes everywhere meaning your start-up company can move in with ease. Braver souls on the tour edged along narrow ledges past enormous circular drops to reach the farthest corners, or hung over the edge with their SLRs, because you only live once. The stairs will have to go. They're old and narrow, and almost as steep as a ladder, and absolutely not what a new business district needs. But they do (eventually) lead to the roof, which is where any decent Open House tour ought to end up, and at Millennium Mills doubly so. Plans suggest that the very top of the redeveloped building will be appropriated by bars and restaurants, these in glass boxes rather the existing concrete bunkers, because in the future it'll be impossible to enjoy a lofty panorama without an expensive cocktail in hand. Hurrah then for the chance to stomp around in safety helmet and boots, and to climb one final wall to the Mill's highest point. I had insufficient wows for this bit of the visit, first the realisation that I'd actually reached the heights of Urbex inaccessibility, second for being up amongst the chimney vents in blazing sunshine, and thirdly for the view. The main draw was Docklands to the west with the City and Shard poking up behind, not quite so close as the Dangleway gets, but without any of that annoying shiny glass getting in the way. The Royal Victoria Dock shimmered below, temporarily decorated with a warship because of the Arms Fair at ExCel. The Barking and Essex direction was, sorry, a bit dull, which Shooters Hill never is. Meanwhile over by Barrier Park a forest of cranes were busy erecting something blandly cuboid, a fate which'll soon befall the expanse of cleared tarmac and vegetation surrounding Millennium Mills on three sides. I know that the Silvertown Partnership only allowed us up here for PR reasons, our token presence another box ticked on the Community Engagement list. And I know they kept the numbers down because organising these tours is a complex and expensive thing, and because it only takes a small gesture to inspire acres of coverage in the media. But I'm well chuffed to have been one of the handful to get the nod, and to get the opportunity to report back on your behalf. 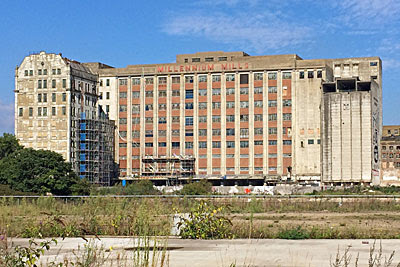 I suspect the rebirth of Millennium Mills itself is going to be the best thing about this future development - it'll make a great communal office block with true character and elevated accessibility. The rest of the site I'm less sure about - the masterplan looks extremely cramped with an eye on maximising rent, and the less said about the brand village the better. But in September 2015 before the refit kicks in, just OMG wow.